Now that we're in the dog days of DVD, as Blu-Ray is creeping in and digital downloads are looming in the distance, the one thing that can be counted on when a remake or a re-imagining of famous source material hits theatres is retails shelves being flooded with back-catalog titles tangentially related to the new film. Every now and then, attentive viewers can catch a movie they've never heard of in this glut of titles. For example, the release of Warner Brothers' Sherlock Holmes caused previously unavailable or forgotten Holmes films to get their day in the limelight. Such was the case with Murder By Decree, released by Lionsgate late last year, a film that has an interesting premise to say the least. 1979's Murder By Decree is based on an "Original Script" by John Hopkins, taking the Jack the Ripper case and inserting the facts into the fictional world of Sherlock Holmes. It's a clever idea, one that was used later the same year in Nicholas Meyer's Time After Time (which sets H.G. Wells after Jack the Ripper*). The film has a wonderful cast, and works in a number of ways, but suffers from a setback that I cannot quite come to terms with. The film manages to blend the Ripper mythos with the Holmes canon fairly well; well into the career of sleuthing, Sherlock Holmes (Christopher Plummer) and Dr. John Watson (James Mason) are celebrities of a sort in London - a scene where Watson chides Holmes for his lack of humility stems from the latter's insistence on riding in an open carriage to be recognized - but thanks to political machinations in Scotland Yard are on the outs with the police. When a local organization in Whitechapel approaches Holmes to help with the murders, the duo find themselves welcomed by Inspectors Lestrade (Frank Finlay) and Foxborough (David Hemmings), but are threatened with arrest by Sir Charles Warren (Anthony Quayle), a Royalist and the new head of Scotland Yard. Holmes and Watson are left to piece together the clues on their own, and quickly discover something much more sinister than a serial killer in London's East End. I added the above quotations to original script because the film neglects to mention until the closing credits that Hopkins screenplay is based on Elwyn Jones and John Lloyd's "The Ripper File." 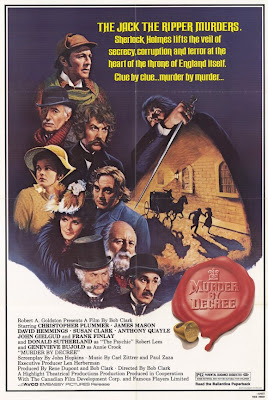 As I imagine that many of you haven't seen Murder By Decree but have seen the Hughes brothers' From Hell, much of the intricacies of the mystery will already be familiar to you. Even if you've had a cursory interest in the Ripper killings, you can probably figure out where Murder By Decree is headed before Holmes gets there, which does not work to the favor of a two hour movie. What does work for Murder By Decree is the cast; the aforementioned Plummer and Mason have a comfortable relationship as Holmes and Watson that doesn't rely on reducing either one to stereotypes (the most common being Holmes as the distant savant and Watson as the buffoon sidekick). Instead, they behave as colleagues would who spent years together working in tandem, and the two actors have a banter that suggests this pairing extended well before the movie started. But there's also fine work being done by David Hemmings, Anthony Quayle, Genevieve Bujold, Susan Clark, Frank Finlay, and Donald Sutherland, who plays psychic Robert Lees, a man who knows more than even he is willing to tell Holmes. Fans of A Christmas Story will recognize actress Tedde Moore (who plays Mrs. Lees) as Ralphie's teacher Miss Shields. Murder By Decree was directed by Bob Clark, who is alternately known to various genre fans for a wide ranging body of work (if you're into comedies, then he made Porky's, Children's movie fans know him best for A Christmas Story, and horror nuts have Clark to thank for Deathdream, Black Christmas, and Children Shouldn't Play with Dead Things). Here, Clark is operating somewhere between slasher movie and period drama. The early parts of Murder By Decree alternate effectively between foggy Whitechapel and pristine Baker Street, and Clark makes the most out of the model shots that establish London throughout the film (Murder By Decree was shot partially in London and partially in Canada). When Clark shoots Jack the Ripper on the prowl, there is a hint of the anonymous killer POV shots from Black Christmas, although we're given too many good looks at the Ripper's face too early in the film for my money. Despite this, I can't quite shake the impression that Murder By Decree feels like an elevated "made for TV movie." I've been trying to put my finger on exactly why, but it's not one element that does it. Partly I blame this on the lighting, which often has no sense of mood to it; instead, every set is lit evenly, so that even when characters should be hidden in shadows, they're clearly visible. There's no depth to any of the locations of sets because of the flat, television-esque cinematography. The music doesn't help much either; when it's not jarringly inappropriate for the scene, it fails to create a mood that's conducive to the story. The editing is also a prime culprit, lending an episodic structure to the film that strips it of any narrative cohesiveness. It seems that whenever a scene is done, the camera lingers for a little too long on the establishing model shot of London, as if punctuating commercial breaks. Murder By Decree establishes no rhythm in the story, and while there is an action packed chase between Holmes and one of the murderers, the scene which immediately follows it lacks the gravitas I can only assume Hopkins and Clark were aiming for. SEMI-SPOILER ALERT: Holmes confronts the Prime Minister (John Gielgud), Sir Charles, and another high ranking member (forgive me, but the name escapes me and IMDB is less than helpful in this matter) about a Masonic conspiracy to protect the Royal Family that necessitates the "Jack the Ripper" murders, and while the scene should be a tense challenge of power by the great detective, the flat lighting and ho-hum editing rob the sequence of any power. Instead, it's a rather long scene where Plummer lays out the facts of his case and Gielgud and the others claim to know nothing about it, ending in a stalemate completely undermined by a chirpy ending of Holmes and Watson riding around in a carriage laughing. That may also have something to do with the "TV" feel, as the credits have a "Blah Blah was played by This Actor" text while a "memorable" scene they were in plays silently. And yet Murder By Decree was released in theatres in February of 1979. It's not a bad movie by any means, but what does work - the acting, some of the atmosphere and mystery - is often canceled out by unintentionally dull lighting, awkward pacing, and an overlong running time. I recommend renting Murder By Decree if you're a Sherlock Holmes fan, if you have an interest in Jack the Ripper (or From Hell), or if you'd like to see that the Guy Ritchie take on the Holmes / Watson relationship didn't simply materialize out of thin air (one could easily make the argument that the Plummer / Mason dynamic is echoed in the Downey Jr. / Law relationship). Stay tuned for tomorrow review; since I brought up Jack the Ripper today, it's only fair to segueway into another movie that tangentially involves the Whitechapel murders - the 2010 remake of The Wolfman. * The Holmes / Jack the Ripper crossover was also the subject of 1965's A Study in Terror.